The Common buzzard (Buteo buteo Linnaeus, 1758) is a raptor belonging to the order of Accipitriformes and to the family of the Accipitridae. It is one of the most common European raptors and is widely diffused in the most varied habitats as it has a strong capacity to adapt to the environmental changes caused in these last decades. Though in some areas it has been noted a slight decrease of the population, in others there is on the contrary a bigger diffusion and a rather growing density. Time ago it was a bird not too much present close to inhabited areas, in particular in the south European and Mediterranean countries, perhaps also due to the hunt it was subjectes but also because being a somewhat shy and reserved animal, nowadays, on the contrary, it is often observed approaching our habitat with more familiarity. Presently, it’s considered by many as the bird that, more than any other, gets closer to the rural dwellings and seizes small domestic animals, this as proof of its determination towards the human being. Actually, it does not disdain to take some chicks or some rabbits left free in domestic enclosures, in particular in the country farms, environment it has now conquered and strongly civilized. This habit is amply shared with the Black kite (Milvus migrans), by sure more guilty than the first and with whom it shares range and habitat but for the common people it’s always and unfailingly the usual buzzard. This raptor loves flying high in the sky with ample concentric circles during the nidification period as well as during the seasonal migrations. The buzzard spends most of the time carrying on this activity during which it controls the territory, looks for its preys and when migrating, after having reached remarkable altitudes, makes very long glides that take it gradually towards the wintering places. Not all the buzzards are migrant and only those living in the northernmost area come south for various degrees of latitude for spending the hard continental winter. In some periods of late autumn and of winter, in these wintering locations occur high concentrations even if the buzzard during this season becomes highly territorial and does not tolerate the proximity of other individuals, regardless of their being males or females. In any case during some periods of strong famine, determined by long periods of strong frost or of snow cover, more birds have been seen nourishing around the same carrion. The buzzard is a bird of prey that preferably hunts live preys but does not disdain the necessity of nourishing of dead animals. In northern Italy it is thought that the remarkable diffusion of this raptor is due to the strong presence of the Coypu (Myocastor coypus), its usual prey, that has nowadays invaded the agricultural areas of the Po Valley. 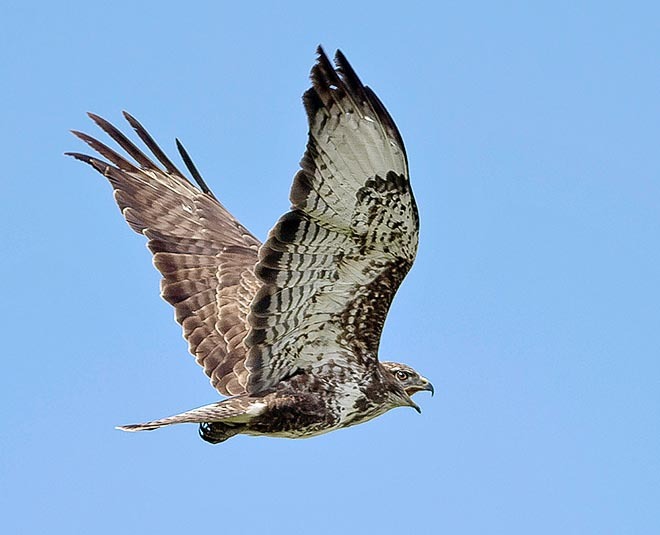 The scientific term Buteo comes from the homonymous Greek term “ buteo”, that rightly means buzzard. 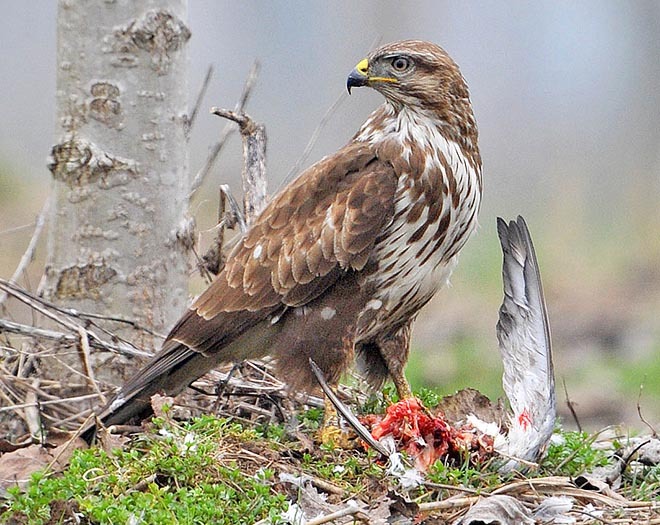 In Europe it is called: Common Buzzard in English, Mäusebussard in German, Buse variable in French end Ratonero común, busardo ratonero, busardo euroasiático or águila ratonera in Spanish. The buzzard is present in the whole Europe and in Asia along the temperate belt up to Mongolia. It is present in the Middle East, in India and in eastern Africa up to South Africa included. It lives also in north-western Mediterranean part of this continent but is totally absent in the central and south-western part. It avoids only the Arctic and sub-Arctic areas. On the Alps, it lives also high in the mountains over the limit of the arboreal vegetation, where it takes advantage from the presence of steep rocks for the nidification. As we said before, the buzzard living in the northern areas migrates south starting from the month of September, with movements of various thousands of specimens that following pre-established routes reach the further south ranges of the Middle East and East Africa. Famous are the sightings and the flights across Gibraltar and the Bosphorus, practically two funnels where these migrations unbelievably do concentrate. 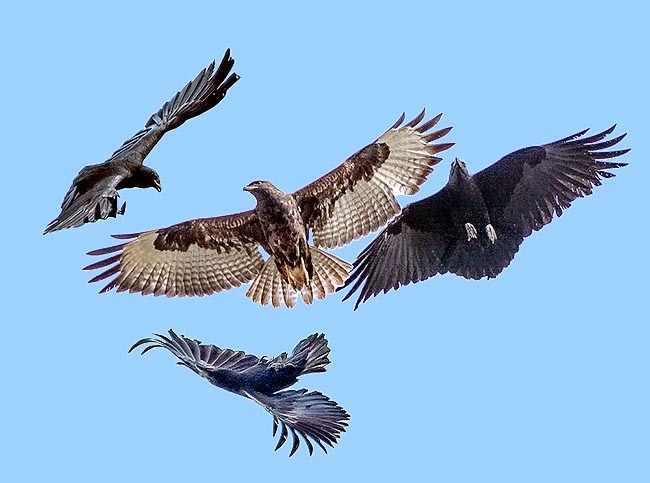 The Mediterranean buzzards and those of the temperate areas are on the contrary sedentary. The buzzard prefers the wooded, even densely, areas but in these last decades it has increasingly occupied open spaces, prairies, pre-desert zones, cultivated areas, environments that once were its usual hunting areas but that, with the time, have become also stably inhabited zones. The spreading of the poplar plantations along the rivers and in the flood plains has then accelerated this movement so much to render this bird now a usual vision in these environments. Also in open country a simple grove of a few high poplars is sufficient for creating the habitat suitable for its nidification and it is normal to find it now even in vast gardens of the outskirts of town with high trees especiall evergreen or entangled with wild ivy. It loves hunting in open spaces often keeping perched for hours on some branches wairting for a prey to venture in the space below. In England its choice victim is the wild rabbit and indeed this bird has suffered during the years when the myxomatosis had affected these mammals, strong reductions in the number. In other habitats it hunts mice and voles, swamp chicken, pigeons, young pheasants and other gallinaceans adding sometimes, when the occasion arises, some small rabbits or domestic chicks. Its preys are carefully picked clean, slowly and with incredible care leaving by the end of the banquet the skeleton of the ill-fated perfectly clean and white. The buzzard can be mistaken with various much similar raptors, often belonging to its same genus and this fact is even more accentuated by the huge variety of plumage this bird has in its various liveries. 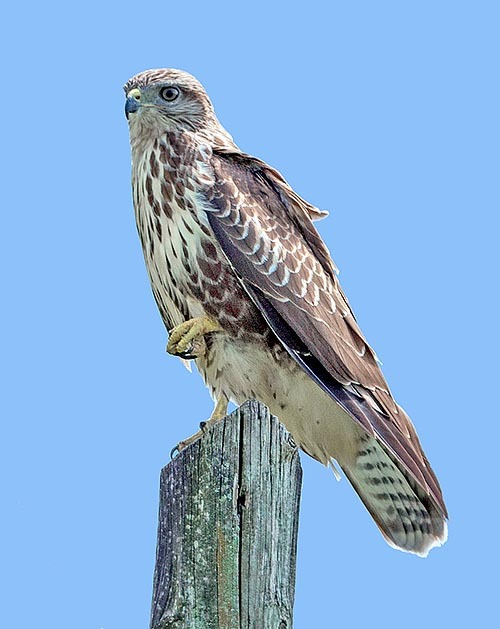 There are buzzards in the so-called dark phase and those in the light colour one, those with the horseshoe on the chest and those completely white, specimens with showy spots in the underwing and others totaly dark, those of amber colour and the traditional ones and then those of small size and the bigger ones. It is therefore clear that we need to get a certain practice in recognizing, first of all, if the bird observed is a buzzard of the species Buteo buteo or a Buteo rufinus, or a Buteo lagopus or the subspecies Buteo buteo vulpinus so much common in East Europe and that often hybridizes with the typical form of the continent. It is then often mistaken with the Pern (Pernis apivorus) extremely similar bird and distinguishable only through the slightly more elongated neck and tail, the bars of the tail and of the chest and the yellowish eyes. 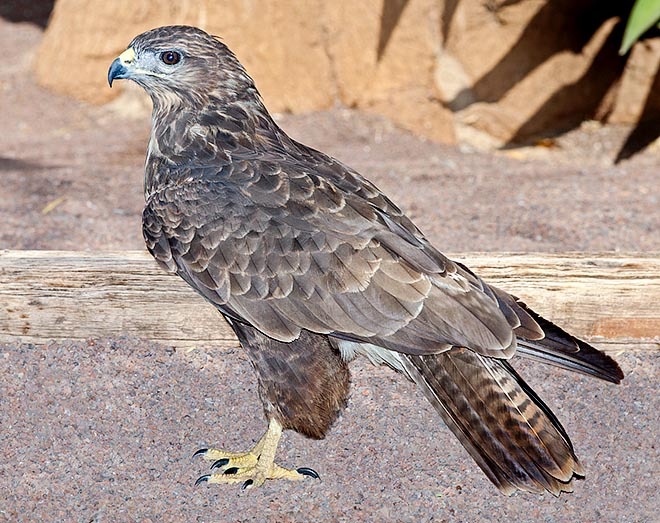 The buzzard is 50 to 60 cm long with a wingspan up to 130 cm and may exceed the weight of 1300 g. It is a massive raptor with very ample wings and rounded typical to the gliders that often overcomes with a slowness typical to the vulture. The tail is well formed even if not extremely long and showy. It has compact grey brown colouration on the whole body with a usually paler chest where is present, in the upper part, a whitish belt curved like a collar. This drawing is rarely present in the migratory northern subjects that result in being paler in the livery and occasionally almost totally white, the so-called “light colour phase”. The underwing is much variable, especially in the coverts that may be dark, reddish or white whilst the remiges are always light coloured and constantly marked by fine bars. Also the tail is barred with numerous blackish belts. An always present clue is “the fist” that is the carpal black spot. 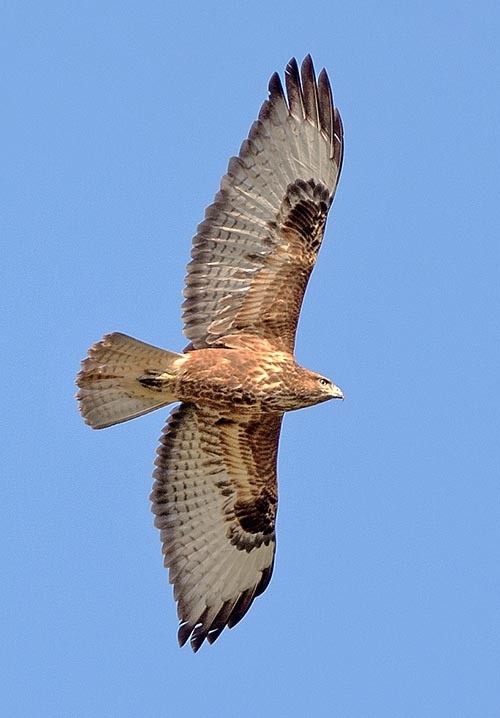 Other good clue is that during the flight the buzzard keeps the neck retreated into the body that in the silhouette diversifies it from the aforementioned pern. The juveniles have a more spotted livery and less visible contrasts in the underwing. 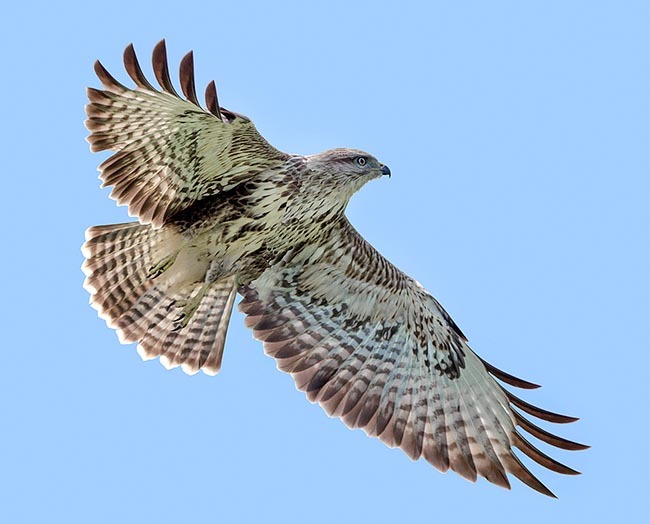 A dozen of subspecies have been identified dividing the populations in two huge well distinct areas: the western races almost sedentary, the so-called “European buzzards” and the eastern ones, mainly migrant, called “steppe buzzards”, species that often may create hybrid populations in the areas contact points. The buzzard usually nidifies on high and old trees that dominate the territory and places the nest in vey high positions taking advantage of the highest bifurcations. It usually lays 2 to 3 eggs by early spring but at times even later in the season maybe due to the fact of having abandoned a first nest, even if not completed, as a result of some disturbance. The eggs are white more or less spotted of ocher and become always dirtier during the hatching, till when they are almost totally brown. The hatching lasts an average of 5 weeks and the young keep in the nest for 50 days more. The buzzard defends fiercely the nest and often gives hint of attack also to the persons who inadvertently approach the nest. During this period it frequently flies over the area occupied by the nest emitting continuously its penetrating and plaintive whistle. The young during their stay in the nest are initially very cautious at every danger and noise and live practically flattened in the bottom of the nest until when they are able to move the wings and to remain poised on the margin of the structure. As usual in raptors, under the tree where the nest is placed, often can be seen vast areas much sprinkled of white, result of all the excrements that are thrown with force by the young from the margin of the nest. In high mountain or in pre-desert areas the buzzard can nidify on rocky walls or on small trees grown clinging to these steep walls. All buzzards enjoy of an excellent status and are not considered as subject to any type of risk as their number is extremely high in any point of their range. Buteo vulgaris Gesner, 1555; Falco buteo Linnaeus, 1758.